Whatever impression the media has been giving people about marijuana, new events are graduallybringing the truth to light. I love the development; I am sure a lot people out there dotoo. But what about senior citizens? Back in their day, marijuana was being portrayed as a highly toxic plant which poses a lot of health risks if used…they almost branded it evil! Unfortunately, the age group that is misinformed the most are the oldercitizens. But ironically, marijuana is useful for them, as much as it is for younger adults—in fact, they need it more. So, if you are of senior age and reading this, I advise you follow through. Let me help you unlearn a few lies you’ve been told. I really don’t watch movies but once in a while,I tune on to health and fitness stations.So,relaxingwith my marijuana-infused green tea on a Saturday morning, I switched on my TV to watch one of those episodes.It was a man probably in his mid-sixties, and he hadParkinson’s Disease. Iwas a bit surprised to see some pre-rolled jointsitting on the table right before him… like “who the hell put that weed there?”. He got help from a younger fellow with lighting one up. In less than 3 minutes, he started controlling his muscular movements. In 5 minutes, he appeared so calm and coordinated…after a few puffs of weed,he looked so normal. It was amazing. Ageing makesus susceptible to diseases. The rate at which leukocytes reproduce dwindles, and immunity weakens. Many elderly infirm people live on drugs they use daily.These drugs have prescriptions, not using them correctly is a fatal risk. Sicknesses like high blood pressure is like time bomb. Arthritis is like a nightmare. Cannabis is a natural treatment for ailments like these and many more which is prevalent among the older generation. And I never heard the news that a senior citizen who uses marijuana died from an overdose. If you’restill reading this, and you are a senior citizen who’s not sure if he should order online weed, please go ahead. I will tell you the reasons why you should. 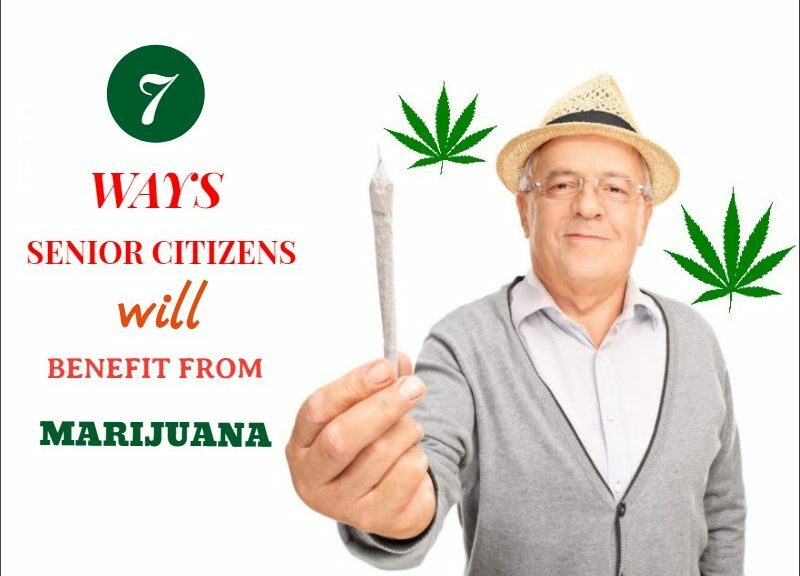 Here are 10 ways seniors and elderly people will benefit from marijuana. Marijuana can lessen the use of, or even replace prescription meds. The healing properties of Marijuanaeffectively treats a wide range of diseases including headaches, chronic pain, insomnia, arthritis, high blood pleasure, digestive disorders, constipation, anorexia, nausea, and many others. It also has a property that enhances the potency of commonly prescribed drugs such as analgesics and appetite enhancers. Usually, the combination of drugs prescribed to sick seniors are not all for the disease. Some drugs are to cure the side effects caused by another drug. If you use weed frequently, you wouldn’t be needing most of those drugs anymore. Marijuana has powerful antioxidant effects. An ongoing research on marijuana discovers that “a personweighing 140 poundswill have to consume more than 4 pounds of marijuana in one sitting to reach toxic levels”.—SeniorDirectory.com. The antioxidant properties in cannabis gives relief to people suffering from liver inflammation, lupus, and other medical conditions that cause inflammatory symptoms. Marijuana-infused oils cure neuropathy pain. To be a marijuana user, you don’t necessarily need to smoke a joint. Cannabis-infused ointments and cream are locally made. They are very potent in suiting sore joints and muscles, and chronic back pain. These are common physical conditions in senior people. Marijuana serves as an appetite stimulant. Some elderly people who manage health conditions often experience appetite loss as a side effect of their medications. Frequent use of recreational marijuana does not only increase appetite, it also cures nausea. It is edible, nutritious and tasty. Like I mentioned before, you don’t need to inhale marijuana smoke or vapor to be a recreational user. When infused in edibles, marijuana provides the same health benefits. That’s good news. Senior citizens don’t have to worry about the ‘high’ part associated with smoking marijuana anymore. Cannabis is infused in honey, candies, cakes, and noodle soups. It has great taste and flavor. A fair number of elderly people in the U.S. live with eyesight conditions like glaucoma. Progressive research on neurodegenerative diseases report links between marijuana use and improvement in the condition. I remember my dad started having trouble finding hours of sustained sleep as he grew into his fifties. Quality sleepfor a senior citizenis very important in preventing age-related neurodegenerative conditions. Alzheimer’s disease can be treated effectively with cannabidiol (CBD). CBD minimizes lighter sleep phases and induces deep sleep phases. If you are a senior citizen and you’re still reading this, then you’re reading right. I advise you order online marijuana when you have the need to use it. Use responsibly. It will not kill you; it will make you stronger.